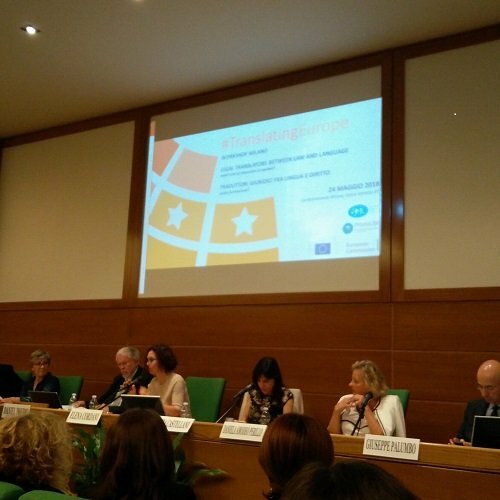 On 24th May 2018, I attended the #TranslatingEurope Workshop “Legal Translators Between Law and Language –What Kind of Education is Needed?” in Milan, Italy. Most of the workshop was in Italian – so it was certainly a challenge for me because….. sto imparando l’italiano! This workshop aimed to raise awareness about the need educational programmes to equip legal linguists with the in-depth legal and linguist knowledge in order to provide high-quality legal translation services. The event was organised by the European Commission and Federlingue a member of Confcommercio, Italy. Legal Translators Between Law and Language –What Kind of Education is Needed? The workshop started with Katia Castellani (Directorate-General for Translation, Field Officer for the European Commission) introducing the #TranslatingEurope project in Italy. There have already been some workshops and any future proposals for workshops should be sent to this email. Many speakers throughout the workshop including Barbara Arrighetti, (‘AITI’ Italian Association of Translators and Interpreters), Elena Cordani (President of Federlingue), Daniela Amodeo Perillo (President of ‘EULITA’ European Association of Legal Interpreters and Translators), Germana Amaldi, (‘ANITI’ Italian National Association of Translators and Interpreters) all spoke about the challenges legal translators face; they take on extremely taxing and important work and yet remain undervalued. They stressed the need to raise the reputation of translators, maintain high educational standards and regulate the quality of work. Amaldi pointed out that there are range of job opportunities available, for example working with EU and international organisations, courts, translation agencies, freelance, in-house and translating a range of documents – contracts, articles of association, court documents, witness statements etc. Cordani highlighted the need for translators to continue their development by gaining CPD points and by joining associations who can support them and provide a platform for knowledge sharing. She mentioned several associations including EULITA, Unilingue, AITI and AssITIG. Flavia Caciagli, Presidente AssiTIG (Associazione Italiana Traduttori e Interpreti Giuridico-giudiziari) spoke about the legal translator in Italy and mentioned several EU projects in the field of legal translation including QUALETRA, TRAFUT, Lit Search, E-justice. Rosario Azzarelli, (Vice Director URP, Court of Milan) spoke about the experience of translation in Court of Milan and mentioned the court’s website as a helpful resource for Italian legal translators. Manuela Guggeis (Lawyer linguist at Council of EU) spoke about her experience as a lawyer-linguist at the Council of the EU and the long and difficult task of translating EU documents, such as those from the Council of the EU and the EU Parliament, into all EU languages. She also spoke about how an autonomous body of European legal terms is gradually developing because of the differences in terminology amongst Member States. Daniel Toudic, (University of Rennes, Board Member of European Master’s in Translation) spoke about the new European Master’s in Translation (EMT) a partnership project between the European Commission and higher-education institutions offering quality master’s translation programmes. He mentioned that nowadays freelance translators are becoming increasingly common and that the EMT can provide quality training to ensure translation standards remain high. Toudic mentioned some spin off projects from the EMT: firstly, OPTIMALE (Optimising Professional Translator Training in a Multilingual Europe), secondly, AGORA (Transnational Placement Scheme for Translation Students) and thirdly, TransCert (Trans-European Voluntary Certification for Translators). The competencies acquired on an EMT are shown in this document “European Master’s in Translation: Competence Framework 2017”. Giuseppe Palumbo and Pietro Schenone spoke about courses offered in legal translation at their universities. Palumbo (University of Trieste) spoke about the Master’s for Legal Translation and a Bachelor Degree Programme Interlinguistic Communication Applied to Legal Professions offered at his university where the teachers include Prof. Mitja Gialuz (Author of “L’assistenza linguistica nel processo penale” and Co-author of “The Italian Code of Criminal Procedure”) , Marella Magris (“L’ errore in traduzione. Dalla teoria alla pratica”), Caterina Falbo (“La ricerca in interpretazione. Dagli esordi alla fine degli anni Settanta”), Stefano Ondelli (“La sentenza penale tra azione e narrazione. Un’analisi pragmalinguistica”) and Federica Scarpa. Schenone (Director of the Civic School of Interpretation and Translation, Milan) spoke about the programmes offered at the Civil School, highlighting that there are highly selective courses on mediation language, interpretation, translation, international relations and that the classes have small numbers to ensure quality. Towards the end of the conference time was running tight, Ruggero Lensi (Director General of UNI ‘Ente Nazionale Italiano di Unificazione’) spoke briefly about the impact of the next ISO 20771 on legal translation and finally, unfortunately due to lack of time Patrizia Calanni Pileri (Chamber of Commerce of Milan) didn’t have much to add but welcomed questions from the audience.